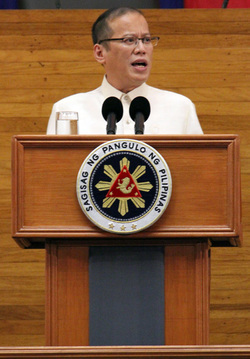 PNoy's SONA: Are you contented or not? Given the persistence of the wang-wang attitude, wasn’t their sentiment justified? This was the attitude that allowed helicopters to be bought as if they were brand new, but had in fact already been extensively used. This was the attitude that allowed GOCC officials, like those in the Philippine National Construction Corporation, to pay themselves millions of pesos in bonuses, even as they failed to render decent service and plunged their respective agencies deeper into debt. Before they stepped down from their positions, the former heads of the PNCC gifted themselves with two hundred and thirty-two million pesos. Their franchise had lapsed in 2007; their collections should have been remitted to the national government. They did not do this, and in fact even took advantage of their positions: the bonuses they allotted to themselves in the first 6 months of 2010 was double the amount of their bonuses from 2005-2009. Yet they had the audacity to award themselves midnight bonuses, when they had already drowned their agencies in debt. Let us look back on the situations of many of our policemen a year ago. The average salary of a common PO1 in Metro Manila is around 13,000 pesos. Around 4,000 pesos or about a third of their salaries goes directly to paying the rent. Another third goes to food, and the final third is all that is left for electricity and water bills, commuting, tuition fees, medicine, and everything else. Ideally, their salaries match their expenses—but this is not always the case. Those whose salaries are not enough would probably resort to taking out some loans. What happens when the interest piles up and they end up having to spend even more of their salaries? Will they still be able to do the right thing when tempted with an opportunity to make a quick buck? Let us turn our attention to the Autonomous Region of Muslim Mindanao. The politics there have been dominated by horse-trading and transactional politics. During national elections, whoever is in power in ARMM is free to manipulate the electoral machinery in his region, ensuring that non-allies do not get votes. That Mayor or Governor then demands payment for his services come the ARMM election; and it is the administration’s turn to manipulate the electoral machinery to secure the win of their candidate. I do not doubt that the reforms we are putting in place will yield concrete results. When we talk about the straight and righteous path, we talk about that new road that was built in Barangay Bagumbayan in Sta. Maria, Laguna. When we say clean government, we are talking about the clean water that residents in Barangay Poblacion in Ferrol, Romblon now enjoy. When we refer to the light of change, we also refer to the electricity that now powers light bulbs in Barangay San Marcos in Bunawan, Agusan del Sur. This is happening in many other places, and we will make it happen everywhere in our country. We have put an end to the culture of entitlement, to wang-wang: along our roads, in government, in our society as a whole. This will bring confidence that will attract business; this will also ensure that the people’s money is put in its rightful place: Funding for infrastructure that will secure the sustained growth of the economy, which will then give rise to jobs, and public service that guarantees that no one will be left behind. More opportunities for livelihood will be opened by tourism; the strengthening of our agriculture sector will ensure that every Filipino will have food on his table. We will invest on those who were once neglected. All this will create a cycle wherein all available jobs are filled, and where businesses flourish through the empowerment of their consumers. I remember a woman warning me during the campaign: “Noy, be careful, you will be stepping on many toes”. I thank the priests and bishops who have continued to dialogue with us, like Cardinals Rosales and Vidal. Cardinal Rosales and I may not be the closest of friends, but I believe that he did all that he could to reduce the tensions between the church and the government. The election of Archbishop Palma, defender of human rights and of the environment, as head of the CBCP only bolsters my confidence that the state and the clergy will be able to engage each other in a positive manner. I likewise thank my Cabinet members, who have sacrificed their personal comfort to fulfill the national agenda. I give special mention to PAGASA, who now truly delivers reliable advice and warnings during times of calamity.